Hello All! It's been quite a while since I've done a 7 Quick Takes, and when sitting down to write this week, the thought that kept coming to mind was- crafting. Making things is like therapy for me. I've always enjoyed crafting stuff with friends, creating things to use as gifts, etc., but I am realizing more and more that making something is one of the absolute best ways for me to relax. After a stressful day, even just a half an hour doing something creative helps my mind rest. Needless to say, with my free time this summer, I have been making lots of things. I thought I'd share seven of them with you, along with a few stories! This cute cross body bag (and three like it) was the result of a group sewing day with friends. It is made completely from vintage/repurposed fabric and coming up with a way to make that work was a fun challenge. Fortunately, they quickly sold though our little craft sale hobby, so I wasn't tempted any longer to keep it! These silhouettes made with pages from Jane Austen's Emma and quotes from Emma & Mr. Knightley are still around...and I just love them. Any other Emma fans out there? This chalkboard rests on the desk in my craft room/office, and I try to change it to reflect the liturgical seasons. This Scripture verse seemed to go with this part of Ordinary Time and the beginning of summer. The chalkboard has some fun history. It is actually just chalkboard paint on the back of a sign that used to hang in one of the barns on the local county fairgrounds. It had outlived its purpose and ended up being given to me. I imagine that the sign is happy in its new life- my apartment certainly smells better than its old home. This cute fake chalkboard sign (paint on foamboard) was part of an ongoing gift for Bonnie. I'm working on building up a set of signs that she can use year round in her living room. This one I love. She picked the lyrics and then the design just came easily one night. Actually, while sketching it out, I was working in the wee hours of the morning. I am a total night owl, and summer sometimes allows me to work on what feels like a more natural schedule to me. The night I was working on Bonnie's sign, I was wide awake and accomplished a great number of tasks from 10 p.m. to 3 a.m. I thought I was on fire- my thought process went a little like this: "This is awesome! If only I could harness this productivity every night! But I am usually shackled with having to wake up at a normal hour in the morning. What a shame because apparently this is when I do my best work..."
But then, in a large dose of humility, I looked down at the letters that I had been mindlessly tracing, and decided that maybe 3 a.m. is not my best time. Prayer sometime also comes easier to me when creativity can be a part of it. After being asked to meditate on Psalm 139 by my priest, I came back to it again the next day and was struck by this verse. Using some fancy new colored pencils (from Germany!) I enjoyed meditating on verse five while doing some Scripture doodling. Trust me, they don't always turn out this cute, but that action does help me reflect and memorize Scripture. And yesterday, to celebrate both of our birthdays, a friend wanted to come over and have a craft day. 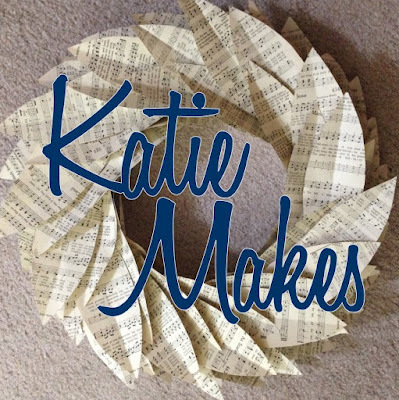 She picked the project, and we both made wreaths out of old book pages. She used more of a rolled paper cone technique, and her lovely wreaths ended up looking like big sunbursts. I decided to try this paper leaf look, and I love how it turned out. Now, if I could just get over my continued horror of actually ripping apart books, maybe I'll make some more! So, that's what Katie has been making lately. What have you been making? Do you find crafting therapeutic like me, or is it a source of stress? Got any good craft-fail stories? I'd love to hear all about it! Go visit Kelly for lots more (probably not craft related) Seven Quick Takes! I watched a craft show on Create this AM. It was about metal stamping. She used a leather sand bag between her sturdy surface and bench block. https://beaducation.com/product_categories/408-bench-blocks It was a little different then our first attempt at your new metal stamps and a cast iron skillet. The colored pencil art looks great. How do they feel? OH....I have a stash of old books just waiting to be made into something beautiful! Let me know when you need more. I'm the Girl Scout leader who struggles with finding crafts. I like to sew, sort of, but I've had so many craft fails over the years that it just isn't fun. Big Emma fan here!! I love those silhouettes!